Cloned from Treppiti by Aeolien. Info: Created on 17th August 2014 . Last edited on 20th August 2014. Clone of my 'development fontstruction' Treppiti. Dimensions are unchanged on the BasicLatin compared to the parent font so that both fonts can be used together if desired. As this doesn't look good and makes reading difficult I suggest you don't mix these two fonts if you want to be read easily. 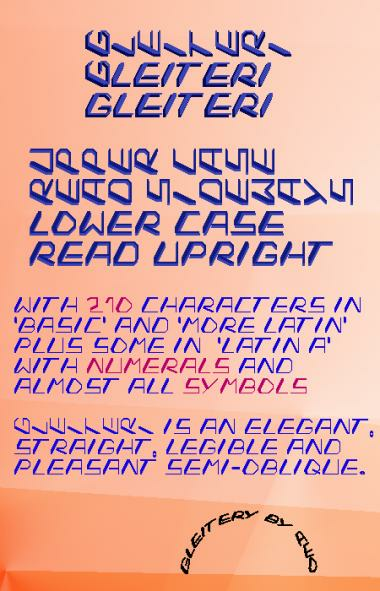 Gleitery has added symbols, numerals and the MoreLatin set as well as a handful of glyphs on the "LatinA". Using both Gleiteri sets together you'll notice that the dimensions in the non-basic sets have changed which might be problematic if you need them to be no wider/higher than the Basic UC & LC. By the way: I have a lot of 'development fontstructions'. They are fonts, part fonts and shape collections that I look at for inspiration and to decide if and what is worthy of more work. They are in a strange kind of way my 'sketch book designs'. I have only about 100 fonts published but have rather a lot of development fontstructions for inspiration. Ah yes, and I have cloned a few fontstructions from others here, interesting ideas to discover and learn from, where it was expressly allowed to clone (not just because the clone button is operational). Again, in this place, a thankyou to nippa and p2p, and soon also to Cirque. Your tools are so useful to me as I do not use filters nor nudging. Congratulations! FontStruct Staff have deemed your FontStruction worthy of special mention. “Gleiteri” is now a Top Pick. I notice that you have smoothed the diagonal lines (as opposed to Treppiti). I thin it looks much better. Thanks p2p :) Treppiti awaited members' opinions on 'sideways' fonts. I got carried away by the shapes and admit that I like Gleiteri very much.